A British 1 shilling embossed stamp, typical of the type included in an investment portfolio of stamps. An alternative investment or alternative investment fund (AIF) is an investment or fund that invests in asset classes other than stocks, bonds, and cash. The term is a relatively loose one and includes tangible assets such as precious metals, art, wine, antiques, coins, or stamps and some financial assets such as real estate, commodities, private equity, distressed securities, hedge funds, carbon credits, venture capital, film production, financial derivatives, and cryptocurrencies. Investments in real estate, forestry and shipping are also often termed "alternative" despite the ancient use of such real assets to enhance and preserve wealth. In the last century, fancy color diamonds have emerged as an alternative investment class as well. Alternative investments are to be contrasted with traditional investments. As the definition of alternative investments is broad, data and research varies widely across the investment classes. For example, art and wine investments may lack high-quality data. The Goizueta Business School at Emory University has established the Emory Center for Alternative Investments to provide research and a forum for discussion regarding private equity, hedge fund, and venture capital investments. Equity crowdfunding platforms allow "the crowd" to review early-stage investment opportunities presented by entrepreneurs and take an equity stake in the business. Typically an online platform acts as a broker between investors and founders. These platforms differ greatly in the types of opportunities they will offer up to investors, how much due diligence is performed, degree of investor protections available, minimum investment size and so on. Equity crowdfunding platforms have seen a significant amount of success in the UK and, with the passing of JOBS Act Title III in early 2016, are now picking up steam in the United States. The investor-led model was introduced by UK-based crowdfunding platform SyndicateRoom and makes it necessary for any startup seeking funding to first be vetted by an experienced investor that is also investing a significant amount (25% or more) of the target round. Only available in the UK, SEIS funds and EIS funds present a tax-efficient way of investing in early-stage ventures. These work much like venture capital funds, with the added bonus of receiving government tax incentives for investing and loss relief protection should the companies invested in fail. Such funds help to diversify investor exposure by investing into multiple early ventures. Fees are normally charged by the management team for participating in the fund, and these can end up totaling anywhere between 15% and 40% of the fund value over the course of its life. Private equity consists of large-scale private investments into unlisted companies in return for equity. Private funds are typically formed by combining funds from institutional investors such as high-net-worth individuals, insurance companies, and pension funds. Funds are used alongside borrowed money and the money of the private equity firm itself to invest in businesses they believe to have high growth potential. In Europe, venture capital, buy-ins and buy-outs are considered private equity. The notion of “infrastructure as an asset class” has grown steadily in the past seven years. But, so far, this development has been the preserve of institutional investors: pension funds, insurance companies and sovereign wealth funds, with very limited access to high-net-worth investors (except a few large family offices). In a 1986 paper, William Baumol used the repeat sale method and compared prices of 500 paintings sold over 410 years before concluding that the average real annual return on art was 0.55%. Another study of high-quality oil paintings sold in Sweden between 1985 and 2016 determined the average return to be 0.6% annually. However, art gallerists are sometimes ambivalent to the idea of treating artwork as an investment. Art is also notoriously difficult to value, and there are quite a few factors to bear in mind for art valuation. The "Merrill Lynch/Cap Gemini Ernst & Young World Wealth Report 2003", based on 2002 data, showed high-net-worth individuals, as defined in the report, to have 10% of their financial assets in alternative investments. For the purposes of the report, alternative investments included "structured products, luxury valuables and collectibles, hedge funds, managed futures, and precious metals". By 2007, this had reduced to 9%. No recommendations were made in either report about the amount of money investors should place in alternative investments. 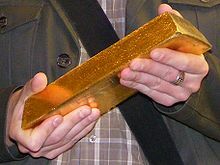 A Good Delivery bar, the standard for trade in the major international gold markets. Alternative investments are sometimes used as a way of reducing overall investment risk through diversification. Liquid alternatives ("alts") are alternative investments that provide daily liquidity. Liquid alternative investments should produce returns uncorrelated to GDP growth, must have protection against systemic market risk and should be too small to create new systemic risks for the market. Hedge funds may be included in this category; however, traditional hedge funds may have liquidity limitations, and the term is usually used for registered mutual funds which use hedge fund strategies such as long-short equity investments. Liquid alternatives became popular in the late 2000s, growing from $124 billion in assets under management 2010 to $310 billion in 2014. However, in 2015 only $85 million was added, with 31 closed funds and a high-profile underperformance by the largest long-short equity fund at the time, Marketfield Fund. In 2014 there were an estimated 298 liquid alternative funds with strategies such as long-short equity funds; event driven, relative value, tactical trading (including managed futures), and multi-strategy. This number does not include option income funds, tactical shorting and leveraged indexed funds. There has been expressed skepticism over the complexity of liquid alts and the lack of able portfolio managers. One of the world's largest hedge fund managers, AQR Capital, began offering funds in 2009, and grew from $33 billion in assets under management (AUM) in 2010 to $185 billion in AUM in 2017 driven in part by marketing mutual-fund like products with lower fees. As of 2016, AQR Capital was the largest manager of liquid alts. ^ Investing, Intelligent. "Five Alternative Investments To Protect Your Wealth From Inflation". Retrieved 7 January 2017. ^ Coslor, Erica; Spaenjers, Christophe (2016). "Organizational and epistemic change: The growth of the art investment field". Accounting, Organizations and Society. 55: 48–62. doi:10.1016/j.aos.2016.09.003. ^ Greenwood, By John (2008-10-06). "First class returns for alternative investments". Retrieved 7 January 2017. ^ "FAQs - The Gold Standard". Retrieved 7 January 2017. ^ Shelly Schwartz, "Investing In The Big Screen Can Be A Profitable Story", CNBC, 18 October 2010. Retrieved 29 October 2011. http://m.cnbc.com/id/39342145/Investing_In_The_Big_Screen_Can_Be_A_Profitable_Story Archived here. ^ "Invest in a forest". 2007-08-24. Retrieved 7 January 2017. ^ "Fancy Color Diamonds to remain the top Wealth Concentration Vehicle". Retrieved 6 February 2017. ^ "Alternative Investments - What is the best way to invest money?". Retrieved 7 January 2017. ^ WPC Conference Committee (9 February 2012). "Infrastructure As A New Asset Class for Pensions and SWFs" (PDF). 2nd Annual World Pensions Forum, Roundtable led by Arbejdsmarkedets TillægsPension (ATP), Denmark’s National Supplementary Pension. Retrieved 17 August 2017. ^ Firzli, M. Nicolas J. (24 May 2016). "Pension Investment in infrastructure Debt: A New Source of Capital for Project Finance". World Bank (Infrastructure and PPPs Blog). Washington, DC. Retrieved 9 August 2017. ^ Baumol, William (May 1986). "Unnatural Value: Or Art Investment as Floating Crap Game". The American Economic Review. 76 (2): 10–14. JSTOR 1818726. ^ Kundu, Dennis; Raza, Alexander (2016). "What drives the value of art?". Stockholm School of Economics. ^ Modig, Karolina (4 February 2017). "Ny svensk studie: Konst en dålig investering". Svenska Dagbladet (in Swedish). ^ E, Coslor (2010-01-01). "HOSTILE WORLDS AND QUESTIONABLE SPECULATION: RECOGNIZING THE PLURALITY OF VIEWS ABOUT ART AND THE MARKET". Economic Action in Theory and Practice: Anthropological Investigations. Research in Economic Anthropology. 30. pp. 209–224. doi:10.1108/S0190-1281(2010)0000030012. ISBN 978-0-85724-117-7. ^ Merrill Lynch/Cap Gemini Ernst & Young World Wealth Report 2003, p.12. Retrieved 28 March 2010. ^ Cap Gemini Merrill Lynch World Wealth Report 2008, p.14. Retrieved 28 March 2010. ^ "The Definition of A Liquid Alternative". Advent Alternatives. Retrieved 7 January 2017. ^ a b "Drowning in Liquid Alts | IMPACT 2014 content from WealthManagement.com". 30 March 2015. Archived from the original on 30 March 2015. Retrieved 16 June 2016. ^ a b Krouse, Sarah (31 December 2015). "The Year the Hedge-Fund Model Stalled on Main Street". Wall Street Journal. ISSN 0099-9660. Retrieved 16 June 2016. ^ Benjamin, Jeff. "As liquid-alt mutual funds proliferate, some question their value". Retrieved 7 January 2017. ^ "AQR hedging its bets with big mutual fund plan". Reuters. 24 June 2009. Retrieved 15 October 2017. ^ Vardi, Nathan. "Inside The Booming Financials Of Billionaire Cliff Asness' AQR Capital Management". Forbes. Retrieved 15 October 2017. ^ Smith, Randall (15 September 2016). "Investors Stick With Assets That Mimic Hedge Funds". New York Times. ISSN 0362-4331. Retrieved 15 October 2017. H. Kent Baker and Greg Filbeck (2013). Alternative Investments: Instruments, Performance, Benchmarks and Strategies. John Wiley & Sons. ISBN 978-1-118-24112-7. David M. Weiss (2009). Financial Instruments: Equities, Debt, Derivatives and Alternative Investments. Portfolio. ISBN 978-1-59184-227-9. How To Invest In Stamps And Coins. Quick Easy Guides. 2008. ISBN 978-1-60620-661-4. This page was last edited on 21 February 2019, at 01:47 (UTC).